Your priorities. Take a few minutes to think about what is important to you regarding Thanksgiving. Some of these things may be highly relevant to the family/friends gathering, such as connecting with them. Or spending time with those you share feelings of gratitude with. Or making sure that you, your children, your partner or others have a positive and safe experience. Or having that once-a-year special meal. Or honoring your annual obligation to extended family. Others are more personal to you, such as taking time to focus on things that you are grateful for. 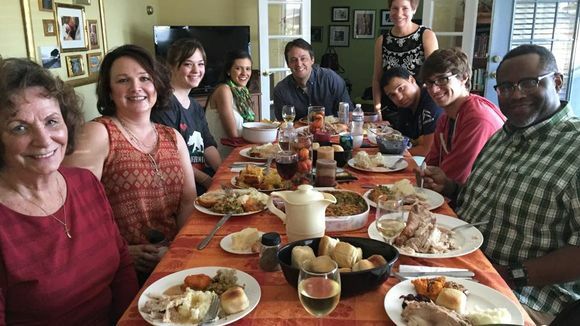 Some may even be best served by not making them a center piece of a potentially divisive family gathering, such as committing to political or social action. What is Thanksgiving about for you? Once we have clarified our own goals or hopes for Thanksgiving it is easier to prioritize what is matters most to us and let other things go. A Politics-free Zone. If are reading this because you anticipate that political discussions over your Thanksgiving table may get ugly, consider having a timeout from politics. Approach the people most likely to engage in those arguments ahead of the meal or visit. Acknowledge that there are strong feelings and opinions on both sides represented in the group and that you would like to have a hiatus from politics because you love and care about each other and want to be able to enjoy each other’s company and enjoy the time together. If anyone wants to engage in a political debate they are welcome to do so away from the table where attendance would be voluntary. Introduce this idea to the whole party, whether or not you get a promise from the most vocal members. Try and get some agreement on ground rules. Doing so before anyone brings up these hot topics makes it impersonal and may even be a unifying moment for people on opposite sides. There might even be a universal, “Phew! I was not looking forward to having to listen to everyone argue either!” response. Whether or not you can get agreement on this, you can refuse to engage in the unwanted talk. Changing the subject can be done in a smooth and seamless way or more obviously and humorously. Uncle starts commenting on the transition team, and you speak up loudly, “How about those Wizards? What are their chances this year?” That may be sufficient, but if it isn’t, a reminder of your request for a politics-free meal can follow. Less controversial topics. There is a universe of other things to talk about. Find conversational areas of shared concerns or experiences. Be interested in other family members and curious about their lives. Maybe do a little advance research to find out what engages them. Come prepared with a number of topics, because some may fall flat while others will get the ball rolling. Join in on conversations that feel safe, even when the topics might be something that you would not normally talk much about. Here is your opportunity to build expected and unexpected connections with others in attendance. Controversial topics. Ultimately though, you do not have control over what others may say or do. If the talk turns to areas you disagree strongly about, try listening to understand. Separate out someone’s positions from who they are as a person. Check your assumptions at the door. Here is a chance to get an inside view of a perspective that may not make sense to you from someone with whom you have a personal relationship. And when you do speak, be respectful. Do not make it personal. Just as we can politely disagree without denigrating each other about whether pumpkin or pecan pie is better, so too can we try to apply a similar level of civility when we disagree about Trump vs Clinton vs Johnson vs Stein. Yes, the stakes are higher, but bringing an elevated level of anger, panic or fear to the Thanksgiving table will not change the political reality and will only add to the divisiveness. You are probably not going to make anyone see the light or persuade them to your position through a heated argument over dinner. If it gets too much. Find supportive allies, whether they are there with you in person or are privately reachable by text, phone or internet. Know that they are in your camp and it will be safe to vent to them. I know one couple who discretely text each in the middle of family gatherings when someone else at the event is driving one or the other of them nuts. It lets off frustration, helps them avoid saying things they will later regret, and doesn’t escalate things. But do not use social media as a place to vent—it will only further damage family relationships. If others are getting upset, try to be calming, comforting and supportive. You can empathize with someone’s emotions even when you don’t agree with their opinions. Validating their feelings does not endorse their position. If you are getting upset, be prepared with healthy ways to calm and take care of yourself. You can listen to music in your head or with earbuds or imagine yourself in a calm and soothing place. You can opt out of the conversation and turn to someone else to talk with. You can leave the room, go watch the game, putter in the kitchen, or leave altogether. Have an escape plan; Thanksgiving is not mandatory, however obligatory it may feel. And remember that bringing together diverse people in challenging times is built into the fabric of Thanksgiving. We can imagine that the Pilgrim colonists and the Wampanoag Indians had serious political and cultural differences—yet they apparently set them aside for the first Thanksgiving. We know that when Lincoln proclaimed Thanksgiving a national holiday in 1863, our nation was in the middle of a civil war. And in 1939 when FDR set aside the fourth Thursday of November as a permanent Thanksgiving Day, we were coming out of a great depression and heading into a great war. It was a time when people were struggling for survival. With the passage of time, the Thanksgiving of 2016 may be added to this challenging list, or it may subside into countless other nameless years. But as with all of them, we want to be able to say that we did the best we could do, and we got through to the other side with our relationships intact. Very good advice from a very professional and learned therapist. Her ideas could also be useful to a collection of therapists trying to stay A-Political in a therapeutic situation or gathering.